When it comes to installing commercial swingsets, you’ll be wanting something which requires minimum maintenance, is obtained from sustainable sources, and which gives you maximum return on investment. After all, every business decision you make ultimately affects your bottom line, right? 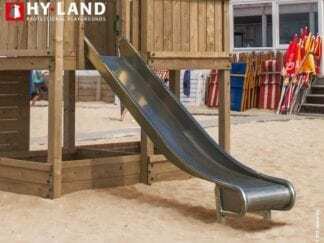 No maintenance saves you money and downtime, the wood used in constructing the commercial swingsets is pressure-treated before it is supplied to you, meaning that it will not require additional treatment. Also, all the wood supplied, comes sustainable sources in Scandinavian/Russian forests. Meaning that you needn’t worry about the impact your purchase will have upon the environment. Finally, it makes for a fun place to play for the children which ultimately results in happy customers. Happy customers stay for longer and spend more money. Keep them entertained for longer with these robust, hard-wearing, weather-resistant commercial swings which are truly built to last. 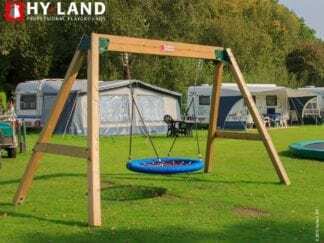 The Hy-land Commercial Classic Swingset is part of the Hy-land professional playground range and are provided with Bolt Protection Caps to prevent accidents, Solid Floor Brackets for installation on grass or hard surface and 4 swing seats along with fittings and tools. Also available within this range are the commercial nest swing set and the stainless-steel slide. The nest swing is a great fun way for children to share to joy of playing on a swing together. The stainless-steel slide with never rust, is attractive to look at and, due to its incredible strength requires zero maintenance. All items are provided with a 2-year guarantee and are built to withstand the rough and tumble of children at play.